I’ve previously mentioned that Fantasy Flight Games has a new Living Card Game (LCG) coming out called Warhammer 40,000: Conquest. Needless to say I’m pretty excited about it… Perhaps not as overly geeked out as I am over Imperial Assault (see previous story), but it was one of the games I was most excited for prior to GenCon (since then Abyss has slid down a bit and Five Tribes has moved up to just below Conquest and Imperial Assault for the post GenCon stuff). Anyhow, I can’t wait for it to come out. Sadly, I don’t have a play group to play it with. I’m sure plenty of people at the Boardgamers of Greater Akron will be playing it, but it is a bit of a drive to Akron from where I am, and I don’t know anyone local who’s into LCGs. So being able to play the game over the Internet is always a sweet deal. Sure one could use Skype and just put the webcam on the table, but that requires a playlist of people to play with a much larger table than my desk, and a few other complications. Lucky for us, there are methods of playing LCGs, TCGs, CCGs, and other games over the Internet. For card games the two main platforms seem to be OCTGN and LackyCCG. This post will focus on the OCTGN plugin, but I know there is development ongoing for a LackyCCG plugin as well (by another person than the one who did the Conquest one). OCTGN is presently Windows only (though they mention they would like to do a Mac version and touch screen version eventually), while LackyCCG is multiplatform including Windows, Mac, Linux and iPad. Before we continue, let me note that I am in no way involved with this project, either the LCG itself (although, FFG, if you want me…lol), OCTGN or the plugin being discussed below. I don’t cover board games nearly as often as I would like to or should. But at GenCon this year, Fantasy Flight Games announced a new title that has me really excited. Star Wars: Imperial Assault. The game basically is Decent with a Star Wars license and a 1v1 skirmish mode option… I mean I was excited that Abyss was going to be on sale at GenCon (though I wasn’t going, so can’t secure myself a copy… though if anybody is in the area and wants to gift me a copy, cover order goes purple, green, blue, red, pink/orange), and I was excited to hear more about another must have game, Warhammer 40,000: Conquest a new LCG from FFG, which I hear sold out in a couple hours, and of course their Star Wars: Armada game (another must have), but Imperial Assault took me, and I think everyone, by surprise. Huge reveal. The fine folks over at Team Covenant have posted a nice full playthrough… Haven’t watched it fully yet, so excited about it I had to share it right away. Tom Vasel, the biggest video reviewer of board games, finally gets around to reviewing Android Netrunner Living Card Game , a game he admits he was predisposed to hating. Will he hate it like he thought or love it? I’ve pondered Android Netrunner Must Haves before, but didn’t go into much detail about the game itself, or the resources I use to gather information about it. I’ll leave details about the game for another day, but a quick basic before I jump to the meat of this post. I’ve also expanded my Board Gaming in the Canton/Akron Area post to include more information about Netrunner locally. I’ve been able to explore some of the stores in the greater Canton/Akron, Ohio area (CAK as our airport is called), and I’ve formed a few thoughts. My primary interest is board games, Netrunner and LCGs if I ever could play them, followed by roll playing (never get to play those either, but hey…), and then on from there. I list Canton first as I’m closer to Canton than Akron. I live between Alliance and Hartville, and work in Akron (and sadly this new job takes me out of the gaming arena for the moment due to the schedule). So I’ve been wanting to play Android Netrunner Living Card Game … I’ve played a couple times with Ari, but not any real serious games yet. I’ve listened to a couple of the Agenda 7 Podcast and a couple of the Breaking News Podcast, along with some of Team Covenant’s excellent video commentary series, and I’m ready to start playing some more serious games (if I can find people in my local area to play that is). I’ve got the following Data Packs (expansions for the game) so far, What Lies Ahead , Trace Amount , Cyber Exodus and A Study in Static , which are all there are at this point. I’ve added a lot of boardgames to my wishlist… I may break the boardgames into their own list since they would be more equally share-able with the boys… As a reminder the kids wishlist has been updated recently as well. Moyo Go Studio is now available for free. You won’t be able to get technical support from the author, the database isn’t nearly as big as in the paid version, the printing/publishing module isn’t there, and you don’t get the lifetime of free updates, but if you wanted to check it out you now can. Just follow the previous link to the programs homepage. You will need to use some sort of torrent software such as Azureus or utorrent, as the file is fairly big (205 MB) and torrent is the only practical way of distributing it, plus, I am sure, it saves him tons on bandwidth. My dad had given us a gift certificate for the mall, so I used a bit of it at the game kiosk to buy a Go Board. As a bonus, since the holidays are over they have everything discounted so the whole thing came under $20 even with tax. That is the board I got. I review it below the break. I got my first teaching game of Go today, but before I did that I played yet another bot on KGS. I paid no real attention to the marking of dead stones at the end and hit done quickly. Bad mistake, as the game thought Black (the bot) won by 360.5, when the reality was that White (me) won by 66.5. Unfortunately that was a ranked game and is part of my record. So the lesson from that is, pay attention during the mark the dead stones phase. Anyhow, for my teaching game, I played a game against a gentleman from Germany (I won’t say his online name here as I am not sure the rules on such things). It was a quick 13 x 13 game where White won by resignation. I was Black and I had a 4 stone handicap, but was far too defensive. My weakness continues to be corners, which even with the computer I tend to loose out on. Specific things I need to work on. 3×3 invasions when I am on the default 4×4 star point. Building corners period really. Remember to look to connect stones, even if I can’t make a second eye close to the one set, if the other set I might connect to has one eye, then all of them will live. I need to view more moves down the line as I tend not to view too many moves ahead. Reading the review is a bit harder to follow than the initial time through it since the comments appear when they were entered in, and some of my reactions may have been when he was a few moves from where he mentioned something. ChiyoDad Learns Go is my favorite Go Blog. It is a very good website, especially for beginners. It is where I first learned of Hikaru No Go, which I will probably talk about at some future point (warning, don’t read past the Spoilers warning on that page until you have finished the series). Anyhow, ChiyoDad Learns Go, GoDiscussions and Sensei’s Library (a wiki for Go) are all things that every Go player should have bookmarked and visit regularly. I first heard of Go eons ago when Atari was the king of video games. I knew they were named for a Go term, but not much more than that. When they made their Tengen division, I again learned it was a Go term, but thought nothing more of it for a long time. 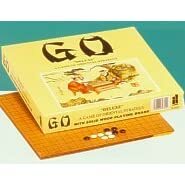 When Pente came out, I once again learned of Go. This time I gained a more active interest in it, but didn’t do anything about it. Somewhere along the line I got back into it again and started learning the game. I learned some basics, and attended a local Go club meeting. Unfortunately for me, the club met at a time and date that didn’t work well for me and I was unable to go. They have since stopped meeting after one of the main guys in the club moved out of the area… not that it would matter since it would most likely still be a bad time for me. 🙂 After being unable to go to meeting, and too intimidated to do anything online, I stopped for a few years, once in a great while picking up a Go book and looking through it. As all things go full circle for me, I am once again pursuing Go, and this time will do more online since there are no local Go clubs. I am learning more this time, and once I get a few teaching games under my belt, I am sure I’ll be good to go (no pun intended). Here we see the marked white stones has liberties at A and B and the marked Black stones have liberties and B and C. Generally when counting liberties that is where I would have stopped. However Black in this case has one more liberty. First is Janice Kim’s excellent Learn to Play Go series. These are basically English translations of books from the Korean Go Association. Very good books to have in your Go library. Some say the problem is that it is spread across so many books, and you get the lessons in one or two books from others, but I like them. A very good introduction to Go. As a matter of fact, I would say this one is nearly a must have for anyone who doesn’t know how to play Go at all. Once you know more than just the basics, it might be a bit to basic, but a great introduction. I am nearly done with this one right now. This is probably the first book to get after the basics are learned, even if you skip the first book. I plan on reading this soon. I started it a long time ago, but never finished it. I am reading this one too right now. It is a nice book. Not an introduction to the game, but an okay book after you know the basic rules of the game. I like the other stuff it covers such as the history of Go and the like. Every Go library needs the Graded Go Problems for Beginners. I have the first 3 volumes. Anything above the first volume right now is above my current level, though I can do some of the 2nd volume stuff.